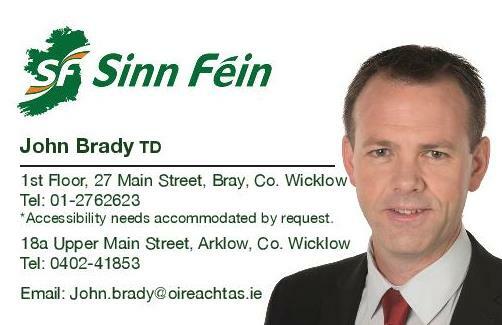 Sinn Féin TD for Wicklow/East Carlow John Brady TD has called on the Taoiseach to fulfil a commitment he made three years ago in replacing the Mobility Allowance and Motorised Transport Grant. “I raised this issue with the Minister of State Finian McGrath back in June when I was told that the drafting of primary legislation was underway yet, nearly five months later there is no replacement in sight. “Last week, I questioned the Taoiseach on when the Mobility Allowance and Motorised Transport Grant will be replaced having been cut with immediate effect in 2013. “At the time, the Taoiseach had said that the €10.6 million allocated for the two schemes would be ring fenced and he hoped a new legal scheme would be devised in the coming months. “Three and a half years later, we are without any replacement. “The thousands of people who relied on these payments to assist with their transport costs have been left in limbo since 2013. “The Taoiseach failed to address my question as to the whereabouts of the €10.6 million that was supposedly ring fenced for the new scheme that was to be put in place a number of years ago.